At Davinci's Green is our favorite color and we like eco friendly products! We provide Environmentally Safe Low or Zero VOC Painting Solutions. At Davinci's we are committed to providing solutions and utlizing eco-friendly materials that will help restore the health of our Planet. Homeowners understand the inherent environmental risks of painting their Home. 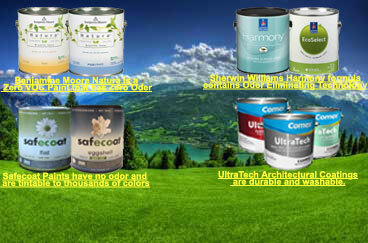 Many paint products produce Gases known as Volatile Organic Compounds which can cause health problems for some people. These days people can breathe easier with Low and Zero VOC Paints that will not evaporate harmful chemicals into your Home. As a customer, you have the right to know that the paint products that we use are safe for your health and the environment. We encourage our customers to choose paints which have the lowest VOC content available and are still just as durable and effective for the job. Being an environmentally responsible company takes time and a committment from ourselves and our Customers. Davinci's is willing to embrace this global environmental challenge fully and we want to help contribute to a more sustainable world. 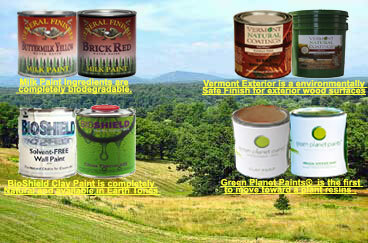 Ask us about the different types of environmentally safe paints that are available. Benjamin Moore, Sherwin Williams, Glidden Paints, McCormick Paints, and Mythic Paints manufacture Low VOC Paints in every color and finish. 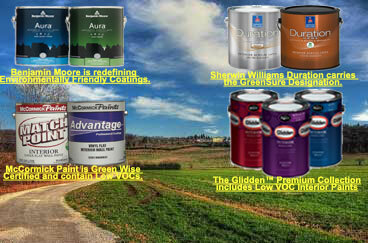 Benjamin Moore, Sherwin Williams, Pittsburg Paints, SafeCoat, and Comex Paints manufacture Zero VOC Paint Products for good Air Quality. 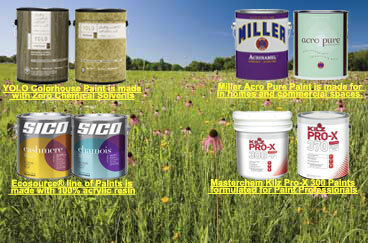 YoLo Colorhouse, Sico EcoSource, Masterchem Paints, and Miller Paints are GreenSeal Certified to be Environmentally Sustainable. Natural Paints have like BioShield and Tierrafino Paints have been tested to provide the best Air Quality and maximum performance and durability. 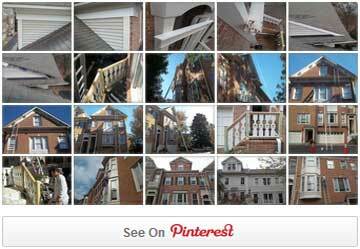 "We really appreciate the help with colors and fine craftsmanship."